Designed for the ultimate in style comfort and construction this chair has contoured cushions and other ergonomic features that make it an outstanding value. * High backrest provides solid orthopedic spine support and full-size upholstered seat is contoured for added comfort. 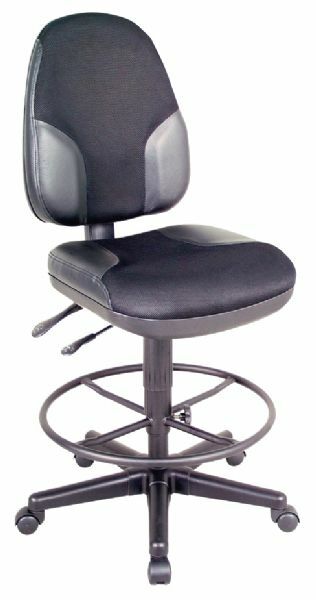 * Features include pneumatic height control polypropylene seat and back shells a height- and depth-adjustable backrest with tilt-angle control adjustable seat pitch dual-wheel casters and a 23" diameter reinforced nylon base. * Backrest is 16"w x 19"h x 3" thick. * Includes CK49 height extension kit and adjusts from 25½" to 30½". * Black chair with leather accents. The seat material is fabric, leather.